Instead of all this talk about culling and killing, how about getting a decent space program and starting other colonies? We'll be forced to learn how to take care of our environment, since these colonies would almost always have to be closed-loop. There will be many more places for the explorers and pioneers to go. Our species will have a backup, since it's not just extinction events that threaten our standard of living, here. "Asteroids are nature's way of asking 'How that space program going...?'" EDIT: The population growth may be leveling out, mainly as third world nation families get out of poverty and more and more women get a decent education. We really only need time to get that improvement out to its practical end, so it's not like we'd necessarily be overpopulating everything. Well, one big problem is that the populations (even in the US) have greatly exceeded the steady state sustainability of our usable resources, especially ground water but also food sources, minerals, energy, etc. We can't put enough amps back in to recharge our batteries as fast as we are consuming the amps. Colorado is now taking water from farmers to supply drinking water to the cities. Forget about using it for industrial purposes (although it would be hell to pay if Coors did not get enough water to make beer). As far as space travel: (1) right now current technology would use more energy to get one person just in to space let alone anywhere else than they could possibly use in a lifetime, (2) current tech in propulsion would put a hell of a lot of chemicals in to the atmosphere - far more than a Rabbit diesel over several lifetimes, (3) ain't enough money in the world to do it for even a fraction of the cost, (4) aren't any places to go that anyone knows of which will support bacteria let alone people. You're just pulling our collective legs aren't you? From your chart it looks like the earth has warmed up about a half degree since 1960 almost exclusively from volcanic eruptions. We have a 4 Billion per day, 1.5 Trillion a year monster called "Climate Change" and you are telling me that there really wasn't a big hole in the ozone letting out carbon gasses and all of the scientist of the day were wrong. I think it is far more likely you have been " miseducated"
Actually, current tech (Space Shuttle main engines) burns hydrogen/oxygen mix, resulting in steam. That said, the SpaceX Falcon series burns kerosene. The cost is coming down, and SpaceX (among others) is already planning on going. That's what I meant when I said they'd have to be closed-loop. Didn't say it would be easy, but I do think it's important. And that may be entirely the case, which does not in any way mitigate the problems created by carbon release on the environment. Yes, it lowers the temperature but what about the effects of carbon being absorbed by the oceans, the resulting microorganism bloom and so forth. It isn't entirely clear that a micro bloom is a bad thing as they are the bottom of the food chain, however anything in excess causes something else. So to say that global warming (or whatever) caused by too much carbon being released isn't happening because of sun cycles is simply ignoring (or trying to paint as false) one thing because of some other completely unrelated thing. Warming is only one effect of carbon pollution. BTW using the phrase "government hacks" tends to cause an otherwise reasoned response to seem.. well.. hackish. We have a 4 Billion per day, 1.5 Trillion a year monster called "Climate Change"
I seriously doubt that any one entity is spending that much. Most likely, that figure is mostly from consumer/commercial spending. In other words, I think you're describing market forces, not government spending. I'm pretty sure the Mauna Loa reference is talking about a NOAA station that is located there. The IPCC has been around since 1988. Care to guess what the CC stands for. Wallace Broecker, "Climatic Change: Are We on the Brink of a Pronounced Global Warming?" Science, vol. 189 (8 August 1975), 460-463. You can thank the GOP for the politicization of "climate change." "A compelling story, even if factually inaccurate, can be more emotionally compelling than a dry recitation of the truth." "As with those other issues, the first (and most important) step to neutralizing the problem and eventually bringing people around to your point of view on environmental issues is to convince them of your sincerity and concern." Once you can fake sincerity, you have it in the bag. "Voters believe that there is no consensus about global warming within the scientific community. Should the public come to believe that the scientific issues are settled, their views about global warming will change accordingly. Therefore, you need to continue to make the lack of scientific certainty a primary issue in the debate, and defer to scientists and other experts in the field." "The scientific debate is closing [against us] but not yet closed. There is still a window of opportunity to challenge the science." 1. “Climate change” is less frightening than “global warming.” As one focus group participant noted, climate change “sounds like you’re going from Pittsburgh to Fort Lauderdale.” While global warming has catastrophic connotations attached to it, climate change suggests a more controllable and less emotional challenge. " “Straight Talk” Memorandum written by GOP consultant Frank Luntz [ he who invented The Contract With America in 1994]. The Memo’s ideas have apparently been utilized by Republican congressional and executive leaders since approximately the end of 2002. These pages 131-146 constitute the wide-ranging memorandum’s section on environment." Volcanoes have a short term net cooling effect. Humans emit 135 times more CO2 than all volcanic activity. Mauna Loa is a the CO2 monitoring station established by Charles Keeling. Good, you've shot the messenger. The message from science is pretty clear. All was well and natural cycles did their part of keeping CO2 levels between 180 and 300 ppm for over 800,000 years. During that time human beings evolved and domesticated plants suitable to that environment. 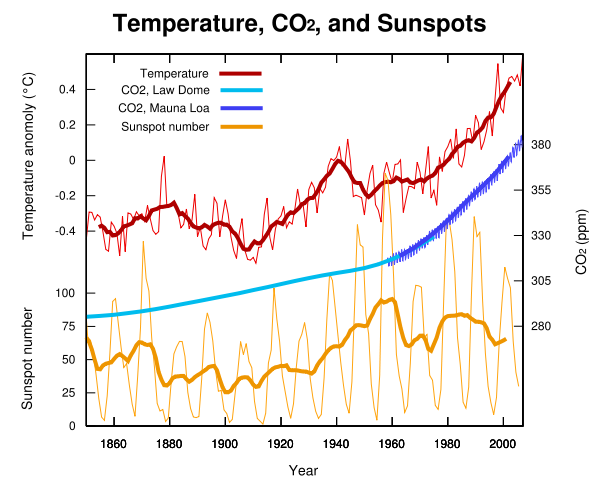 During that time natural cycles like the Milankovitch cycles, would trigger warming releasing CO2 resulting in a positive feedback loop. We had a nice Goldilocks world, "controlled by a natural "thermostat"
Then in the mid 18th century we increased anthropogenic carbon emissions from 3 million tonnes per annum to almost 10 billion tonnes per annum. We were the trigger that added CO2. That increased CO2 levels by about 40% to over 400 ppm, a level not seen for for 3 - 5 million years. Using carbon isotope analysis that 40% increase can be traced directly to burning fossil fuels. We messed with Mother Nature, and she bats last. Geologically speaking, we are still in a CO2 deprived environment. Why do you think that is an optimal situation? The 180 - 300 ppm that existed for the past 800,000 years, to which our food crops have adapted quite nicely, is probably a good range. The last study was conducted at 550 ppm CO2. Those high CO2 levels to which you refer were suitable for dinosaurs and their food sources. lol optimal for who (or what)?. There is the world, which doesn't give a crap about mankind, and there is mankind which doesn't give a crap about the world. The temperatures can swing wildly and the world will go on. CO2 can swing wildly. Hell atmospheric acid rains or acidic oceans just don't mean anything to the earth. The earth has (as you correctly pointed out) has seen wild fluctuations of all kinds of things. As things swung wildly most of life died out (several times) and spent millions of years coming back. It seems logical that man should attempt to not be the cause of the next mass die off. Although if you look at the numbers of organisms that mankind has directly caused the extinction of, it is already too late. I am assuming from your responses that you simply do not believe that mankind has any observable effect on the state of the earth. A somewhat bizarre belief. One thing that has long puzzled me, is how one can bury ones head in the sand without inhaling the stuff?